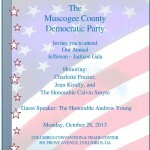 We look forward to seeing all of you at the Jefferson Jackson dinner this year. We have an amazing speaker. Please take a look !